Our goal is to provide advanced gastroenterology care to all of the Northwest Alabama region. Are you 50 Years Old? Colorectal cancer is the second leading cause of cancer death. One in three patients with colon cancer will die from the disease. We specialize in Reflux and Swallowing Disorders. 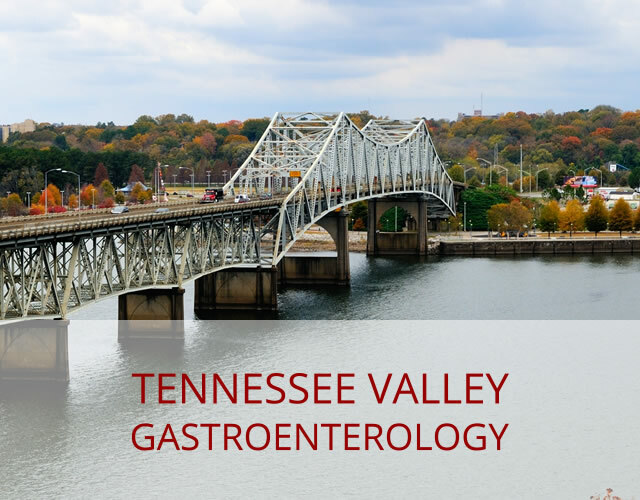 Welcome to the website for Tennessee Valley Gastroenterology. We hope this website will assist us in our goal of providing the best care for people with gastrointestinal diseases in Northwest Alabama. Most of our patients come to us through referrals from their primary care providers. If you feel that you would benefit from our service, please contact your provider to request a referral. Referrals are not necessary for screening colonoscopies. If you have questions about appointments, feel free to contact our helpful staff. Information that you will find on our website includes travel assistance, a way to speed registration, a brief biography and information about our qualifications, and guidance for procedural preparation. Because we intend to deliver the highest standard of care to our patients, the website is not designed to provide online consultations. We are most appreciative of the privilege of living and raising our families in the Shoals and are grateful for the opportunity to give back to our community by assisting in the health care of our residents.